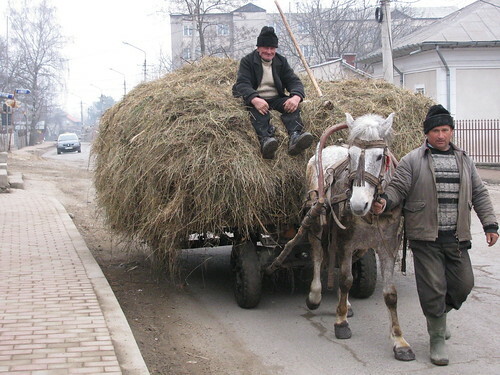 One of my favorite Romanian “things” is the caruta — a horse-drawn cart that’s pretty ubiquitous in more rural areas. Every Monday morning I awake to the clip-clops of carutas coming through town for the weekly market. It’s one of those sounds that I’ve gotten used to and yet still cherish. When my mom came through Romania on her European adventures, she took a picture of a caruta going down a road. Before I left she asked that if carutas were still around to snap a picture. I’ve been keeping my eyes open for almost two years for a good picture, a good caruta moment. Here’s my favorite so far that I snapped in March on the street behind our bloc.